A tooth can sometimes suffer a damage or decay that is too severe to be fixed by a simple filling, or is too minor to be treated with a dental crown. For conditions like these, the best option to conserve more of the original tooth structure may be an inlay or an onlay treatment. An inlay covers the center of a tooth’s top surface, while an onlay is more extensive and covers the entire biting surface of the tooth. Bergen Premier Dental in Ramsey, NJ, offers restoration procedure with inlay and onlay for patients looking to save and restore a fractured or decayed tooth. 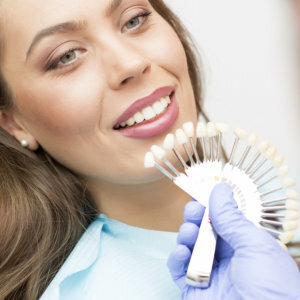 Once your dentist at Bergen Premier Dentistry has determined during a consultation that an inlay or onlay is the right option for you, you will be scheduled for a visit to prepare the tooth for the procedure, which typically involves cleaning the tooth and removing all the decay and plaque. An impression of the tooth will then be taken and sent to the laboratory for molding. Inlay or onlay is molded using durable and hard-wearing materials, such as porcelain, gold or composite resin material, that can last for several years. They are also made to match adjacent teeth for a more natural-looking appearance. The inlay or onlay is bonded to the tooth at the next appointment. Inlay and onlay treatments require very short recovery period. With the right care, your restoration can last for many years, and even decades. They can be maintained the same way as natural teeth with daily brushing and flossing to prevent plaque accumulation and tooth decay. Routine dental cleaning appointments will lengthen the life of the restored tooth. You can experience various cosmetic and functional benefits after tooth restoration with an inlay or onlay. The procedure restores the tooth’s natural shape and function, and will reduce the tooth’s sensitivity. It can also help prevent further plaque buildup and provide ample protection from future tooth decay, thereby prolonging its life. Inlays and onlays help strengthen teeth, unlike traditional fillings which can reduce the strength of your teeth. With highly-experienced and caring dental team, convenient office hours and flexible appointment scheduling, Bergen Premiere Dentistry is the dental practice to turn to for restorative dentistry in Ramsey, NJ. Call (201) 746-4614 today for more information or to schedule your appointment.